Forged in our hidden, underground bunker in the center of the universe, Lightning Golf has taken the golf industry by storm (no pun intended). We at Lightning Golf have been creating and working on our golf ball, the HL3 SmackDaddy, in order to ensure the highest quality tour level golf balls for our customers. We offer our HL3 SmackDaddy golf ball with an optional subscription service. This subscription service is convenient and flexible. You can subscribe for as little as a sleeve of golf balls every 2 months, or as much as multiple dozens every month. To sweeten the pie even more, the balls are sold at a discounted rate to save you time and money. Of course, this service is optional, and you can buy our golf balls just once (Click dropdown menu on product page, and select “One Time”) But seriously, why would you??? All of our products are shipped “direct-to-consumer” with no packaging, in order to provide both low costs for our customers, and a small eco-footprint. We are also absolutely determined to bring you a level of customer service that you have never seen before in the golf industry. If you have any comments, questions, concerns, etc. Do not hesitate to contact us. We would love to hear from you. The concept of making the best golf ball on the planet was conceived while playing golf on the Central Coast of California. When my partner hit two golf balls in the water and said their goes a ten dollar bill. He stated someone needs to make a superior golf ball at an affordable price. We are excited to introduce one of the most advanced golf balls ever created for professionals and amatuers alike. Our goal was to manufacture a ball that will help you lower your score by combining the perfect combination of distance , feel, and spin. Retail golf ball manufacturers spend a tremendous amount of money on advertising, packaging and endorsements. Ariva Golf is dedicated to bringing you quality products at an affordable price. Try the new Ariva Tour golf balls today and we are sure you will be satisfied with the quality, construction, and price. We back it up with our 100% Money Back Guarantee. TheAriva Tour AR-4 are engineered with 4 layers to lower scores through providing the perfect combination of distance, spin and feel.They provide increased short game spin, a softer feel and excellent distance. The 4 piece spins less, has a slightly firmer feel and launches lower for longer overall distance. TheAriva Tour AR-3 are engineered with 3 layers to lower scores through providing the perfect combination of distance, spin and feel. They provide increased short game spin, a softer feel and excellent distance.The 3 piece ball has a larger firmer compression core which provides lower driver spin for longer carry distance, yet maintaining a soft feel. Designed with 3-layers featuring a low compression core, Dupont™ soft outer mantle and cast urethane cover. Extra large firmer compression core provides lower driver spin for longer carry distance, yet maintaining a soft feel. You aspire to be the best golfer you can be. Ball Couture will help you reach your full potential. It is a high performance, fashion forward, fun to play golf ball designed for the stylish player. Ball couture is developed to benefit a women’s club head speed; delivering soft feel and long distance with a colorful contemporary appearance. INTRODUCING THE ONLY 3PC CAST URETHANE BALL WITH TUNGSTEN CORE TECHNOLOGY ON THE MARKET TODAY. THE BALL COMBINES THE MAKEUP OF A HIGH-PERFORMANCE BALL WITH THE CORE OF A DISTANCE BALL. You get length with the addition of the tungsten without losing the feel and spin. Rob Zimmerman is the founder of 3 Up Golf. In case it wasn’t already obvious: he’s absolutely crazy about the game of golf. Rob is married to his college sweetheart, Danielle, and together they have two children who are both shaping up to be quite the little golfers themselves. In April of 2012, Rob suffered a mild heart attack from a severe arterial blockage. With a new lease on life, Rob wanted to give back to others via charity and help grow the game that has given him so much joy. It wasn’t too much longer after that Rob and Danielle decided to start 3 Up Golf. The 2S14 is a 2-piece golf ball unlike any other. Its amazing Deep-Soft core gives players with moderate swing speeds the feel and spin rates of a 3 piece “tour” ball. As if feel and performance aren’t enough, $3 of your purchase goes directly to a golf related charity. The 3F12 is a premium 3-piece golf ball that’s built for the amateur golfer who doesn’t want to compromise distance or feel. We started from the putting green and worked our way backwards to the tee to create this amazing feeling ball. As if feel and performance aren’t enough, we donate $3 to a golf related charity for every dozen sold. Monsta Golf started as an idea back in the spring of 2013 by 2 working dads from Boston who love the game of golf. Ken and Dave, the founders of Monsta Golf, realize the key to an exceptional golf game is consistency. Using the same golf ball while honing your skills is an important factor in being consistent. Almost every brand of golf ball performs differently, especially around the green. This causes variations in accuracy and performance. The top performing brands currently on the market retail for $48/dozen or more. Fast forward a year later and Monsta Golf is born. What started out as conversation on the golf course, is now a reality. We believe our 3 piece cast urethane golf ball is a “premium performance golf ball without the premium price”. The Monsta ball is affordable. Bringing accuracy and constancy to your game. One of the biggest challenges was keeping true to our original mission of bringing a premium performance ball without the high price point. 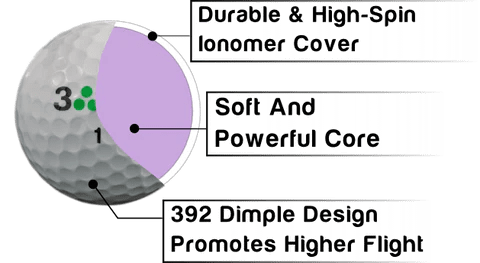 Manufacturing a cast urethane golf ball was key to the soft feel and superior spin we desired, but that comes with a cost. So we made a conscience decision from the beginning to sell direct to the customer, via online, social media, etc., with no retail ‘brick and mortar” stores that require significant markups. Also, unlike the ‘big boys’ we will not have the usual overhead the large companies carry. All of these factors enabels us to keep our promise of an affordable pro- performance golf ball.